The first fruits of my British Academy-funded project have finally appeared in the form of an article now published in the Journal of Education Policy. ‘Teaching other people’s children, elsewhere, for a while: The rhetoric of a travelling educational reform’ was co-written with Meg Maguire (King’s College, London), Tom Are Trippestad (Bergen University College, Norway), Xiaowei Yang and Yunqiu Liu (East China Normal University, Shanghai) and Ken Zeichner (University of Washington, Seattle). The paper is available to download from the Articles page on this website and is Open Access so can also be downloaded freely from the journal web page. The article provides a rhetorical analysis of the Teach for All movement, focusing specifically on Teach for America, Teach First, Teach First Norway and Teach for China. 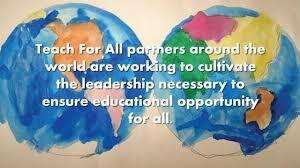 Teach for All is the umbrella organisation for around 36 Teach First-like project around the world and what we were interested in was the way in which this globally travelling teacher ed reform idea ‘touches down’ (to use a phrase used by Terri Seddon and Jenny Ozga) in different places around the world and then grows within the local culture. So Teach for All does not look, feel or do the same thing in its 36 different localizations even though they all strategically appropriate and playfully adapt the same rhetoric. Although the article could be read as a critique of Teach for All, an equally open reading would be that we show just how effective Teach for All and its different projects have been in persuading multiple constituencies that they have the right ideas. And, by implication, how strikingly ineffective universities have been at persuading people about theirs. However, the implicit critique within the rhetorical analysis is that Teach for All presents a challenge to the various national cultures of teaching as a profession on the basis of evidence that is, at best, contentious. Further, by turning school-teaching into a short-term missionary activity in the communities of non-dominant and subjugated populations in order to develop the leadership potential of the ‘elite’ individuals selected as participants, the Teach for All idea does not provide the children and the schools within those communities with what is likely to be more effective in helping them to transform the life chances of those children – high-quality, well-prepared, culturally-literate teachers who are prepared to stick around and build long-term relationships with young people, their families and communities – as well as their colleagues within schools. By sticking around, the evidence suggests, teachers are more likely to be truly effective and expert. In the US, a backlash against Teach for America led by some its former participants has been long underway. 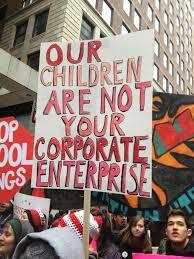 In part, former Teach for America participants are protesting against what they see as the organisation’s role in the privatisation of public (state) education, but they also draw attention to what they see as inadequate preparation for the settings in which they were sent to teach. Articles about this movement and their criticism are available here and here. So it is not just academics who are drawing attention to the problems inherent within the design. That said, Teach for America is on the wane with policy-makers in the US too and there are other, more worrying challenges to an adequate preparation for new teachers emerging through private providers who mimic university structures while providing a deeply ideological, reformist alternative. But that’s a story for another day.